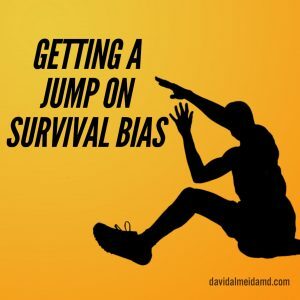 TASK AT HAND: This week I’m thinking about survival bias, also known as survivorship bias. Survival bias is a logic error that produces false conclusions by looking at a person who achieved an outcome and overlooking those that did not, despite both having similar characteristics. Simply put, the “survivor” is used as a model to extrapolate from, only because they survived the event, despite the fact that many similar individuals exist for comparison that did not survive the event. Let me use a couple of examples to illustrate the point. Usain Bolt, the Jamaican sprinter, is heralded as the fastest human ever timed. He is the first man to hold both the 100 and 200 meter records. He is an amazing sprinter, a charismatic character, and a fantastic entertainer. Many have tried to ascertain how he is able to run so fast. Bolt usually states common athletic creeds such as “belief in yourself” and “training hard”. Survival bias enters here because Usain Bolt is the fastest human in the history of mankind not because he trains hard and believes in himself, but despite this. How many athletes believe in themselves and train hard? How many fall short? Too many to count. Many times athletes are asked how they achieve greatness and they usually provide the same predictable answers. The reason is, because they don’t know. They trained hard like everyone else but they, for some reason, were able to produce superlative results. Now, in no way do I diminish these feats. I celebrate them! But, you have to be careful in their extrapolation to your life. Another example. Many want to be the next Steve Jobs and create a behemoth success like Apple. Steve Jobs dropped out of college and started a business. Do you think this was the reason? How many others have dropped out of school and started business that failed? Too many too count. Steve Jobs was the “survivor” of this event and succeeded not because he dropped out of school, but in spite of this. There are numerous examples of survival bias in a myriad of disciplines so one needs to be aware of this erroneous process of reasoning. Survivorship bias leads to overly optimistic and simplified beliefs because only successful survivors are used while the many similar failures are ignored. Most of the time, the failures have very similar attributes and no significant relationship is evident. This important because one needs to understand that successful groups – most of the time – do not have any special property. This does not diminish or lessen their achievement. But, when you are trying to reproduce some of these behaviors, consider both successful and failed examples. The role of timing, coincidence, and serendipity will become apparent. How does this help you? Personally, it serves to balance my emotional reaction to events. I know I’m never as good as my best day. But, I’m also not as terrible as my worse day – and I don’t beat myself up over it. I survive each day, despite how factors beyond my control play out, and I remain focused on what I have defined as important. 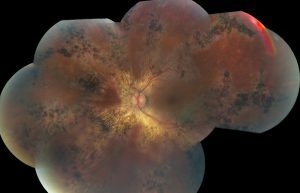 MEDICINE & MACULA: A couple of weeks ago I described our technique for retinal embolectomy. 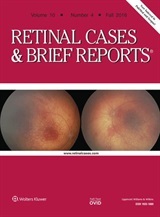 This technique was recently published in Retinal Cases & Brief Reports. Retinal embolectomy involves the removal of emobli from the retinal vasculature in selective cases of arterial occlusions. 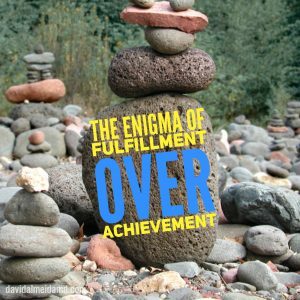 TASK AT HAND: This week I’m thinking about the difference between achievement and fulfillment. Achievement is commonly confused for fulfillment. In the culture of 80-hour work weeks, dog-eat-dog cynicism, and the perpetual climb of the job ladder, one can easily place achievement as the ultimate external benchmark of success. This strategy will eventual burn out. Instead, the focus should be on the internal barometer of fulfillment, to guide our plans. Achievement can be defined as the process of successfully completing a task. As one can see, there is lots of good in achievement. It requires commitment to an end. It emphasizes ability. However, achievement can become an empty end. Without an internal desire for excellence and without a process of development and introspection, achievement can result in empty goals and lackluster methods. Fulfillment, in totality, extracts meaning from our tasks. In other words, it is why we want to achieve a goal? This why is the crux of what fulfills you. While achievement is the “how”, start to think of fulfillment as the “why” to a strategy or goal. People often ask me, “what is the easiest path to fulfillment?” I say: start by collecting experiences and not things! Collecting experiences, for example by traveling, allows you to focus on transitions without some definitive end target. One of the most common end-of-life regrets is the wish to have traveled more during years of good health. Too often, the substitution to the acquisition of items creates confusion in endless consumption. Goods – are only of value – if they are good for something. 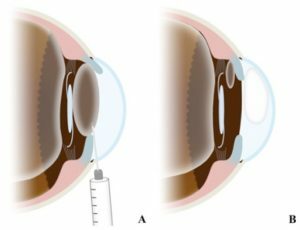 MEDICINE & MACULA: Check out our new publication, Elevated intraocular pressure following pars plana vitrectomy due to trapped gas in the posterior chamber, published in Retinal Cases & Brief Reports (Fall 2016, Volume 10, Issue 4, pages 334–337). 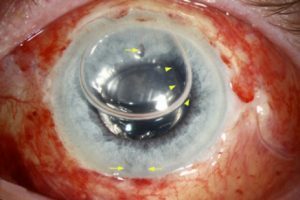 Clinicians should be aware of elevated intraocular pressure secondary to trapped gas in the posterior chamber. Aspiration of the trapped gas can alleviate both pupillary block and angle closure without compromising gas tamponade. GRATIS: In your achievements, find fulfillment. And, in the life you are creating, seek a path that leaves you fulfilled and you will achieve that which is paramount. TASK AT HAND: This week I’m thinking about sunk costs. Also known as retrospective costs or the fallacy of commitment to sunk costs. Do you own an old pair of shoes you don’t wear any more but, because you spent a pretty penny on them, you refuse to throw them away? This is the sunk cost fallacy at work. It is an erroneous approach to strategy focusing on trying to recover your past investment by holding onto something because you cannot accept it is no longer working (Psychology Today, 24 September 2014). By definition, it is a cost that has already been incurred and cannot be recovered. In other words, it’s time to throw away those shoes! 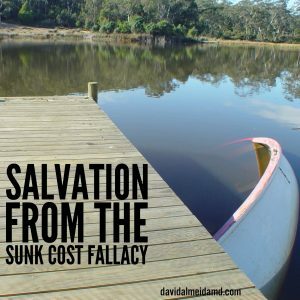 When trapped by the sunk cost fallacy, you become concerned with what you “paid” for something in the past, rather than what you will get out of it in the future. The fundamental problem with commitment to sunken costs owes to it being a backward looking decision. Consequently, it does not offer you any prospects or opportunities for the future. Interestingly, humans are the only animals who honor sunk costs. Other animals will look for new opportunities as soon as previous ones have been exhausted (Psychological Bulletin 125(5):591–600). The fallacy of honoring sunken costs resides in our old nemesis of insecurity. The insecurity that changing or giving up on a sunk cost will show others we made a mistake. This relates directly to the phenomenon of loss aversion: we all fear loss and we all want to avoid it. However, you need to see beyond this. That submerged boat, let it sink. Feel stagnation in your current job but afraid start over? It is time to consider your options. Is there a void in your relationship but deny it because of the “time you have already invested in it”? Abandon old rationalizations and bring yourself to realization. The mindset to best eliminate loss aversion and bypass the sunk cost fallacy is to consider only future benefits and costs when pondering a decision. Assess what you need to invest moving forward. Minimize the desire to include resources, capital or emotion that has been previously spent. The latter is baggage which can weigh you down. By letting go of past costs incurred, you can frame your strategy de novo with improved clarity. MEDICINE & MACULA: I was in Chicago this week for the American Academy of Ophthalmology (AAO) annual meeting! On Friday I presented a talk on our technique for retinal embolectomy at the AAO Retina Subspecialty Day. Retinal embolectomy involves the removal of emobli from the retinal vasculature in selective cases of arterial occlusions. Thanks to everyone for their interest in our technique! GRATIS: For those who know me, a common place to find me is on a squash court. This past week was the Beyond Walls Squash Week in Saint Paul MN. My home club, The Commodore, was the host club. In addition to playing in the A singles draw, davidalmeidamd.com was a proud sponsor of this fantastic event benefiting Beyond Walls. For more information, check out the MN Squash Week page. TASK AT HAND: This week I’m thinking about forgiveness. Whether we accept it or not, it’s easy to forgive our family for errors. It’s convenient to forgive our loved ones for most omissions. We want to let transgressions from friends disappear. But, how about your opponents or those you distrust? What happens when these transgress against you? The simplest strategy for this complex intonation is forgiveness. 1. Forgiveness annoys those who attack you. As the introductory quote above explains, forgiveness – to the closed arms of an opponent – is extremely annoying. Your sporting opponent, corporate rival, or feuding adversary attack you to elicit a reaction. The hope is your reaction is irrational, hastily conceived, and poorly executed. This is the benefits of an attack and why we don’t just engage in predetermined deliberations. By responding with forgiveness, you disarm most of the possibilities your opponent is trying to elicit from you. 2. Forgiveness is strength. Forgiveness is not about being a doormat. Forgiveness is not about being a pushover. “Forgive your enemies, but never forget their names” (John F. Kennedy). Forgiveness is about strength! 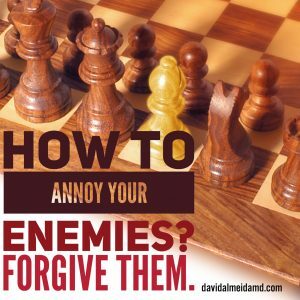 By forgiving, you show restraint and the ability to strategize counterpoints. Forgiveness, in this context, is counterintuitive because of our overriding desire to tap into primal reflexes in moments of duress. But, “the weak can never forgive. Forgiveness is the attribute of the strong” (Mahatma Gandhi). Your opponents will be dumbfounded by your act of forgiveness and your enemies will be confused by this show of strength. Then, consider what the attack was based on and begin to develop a plan that addresses the reasons for the existing adversarial relationship and how it can be mutually overcome. 3. Forgiveness is a sustainable overarching strategy. No one can survive with grudges against all who have ever crossed them. No one can grow while holding anger and resentment in their hand. Strategy, without the ability to forgive, eventually falls to some stronger opponent. However, one who shows forgiveness can broker relationships based on trust. The latter is a fundamental part of a long-term successful strategy. GRATIS: There is another benefit to acts of forgiveness. “If you haven’t forgiven yourself something, how can you forgive others? (Dolores Huerta) If you can forgive others, it means you can forgive yourself. That you can accept events beyond your control. That you can let go of the errors we are all bound to make. 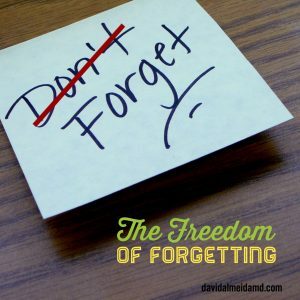 TASK AT HAND: This week I’m thinking about hindsight and the ability to forget. You know the old adage, “hindsight is 20/20”? This is not the whole story. Yes, you can look back and sometimes find explicable nature to events. However, looking back can leave you in an abyss of insecurity. The discrepancies of past actions can hinder our future movement by leaving us stranded on an island of insecurity. 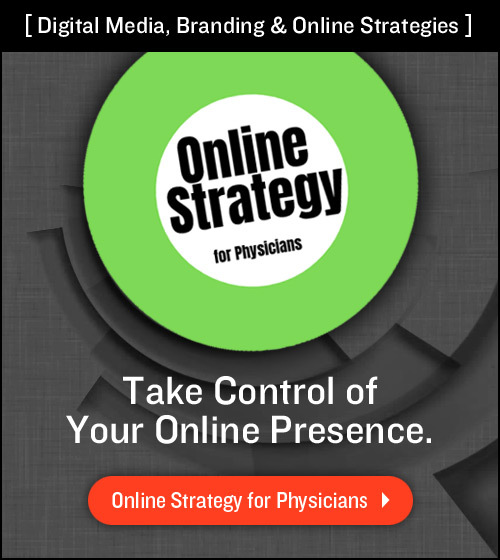 This plagues our ability to decisively carry out optimal strategy. Why is looking back harmful? I heard Andrew Lincoln, the actor who plays Rick Grimes in the television show, The Walking Dead, say: “I would find myself getting deeply distressed if I lived in hindsight all the time”. I like this. Past events, while they allow you to learn and thus are of value, they can also paralyze you from future action if you do not let them go. They create bias in your vantage point that can then preclude you from realizing the potential of events not yet happened. The ability to forget. The skill of not remembering allows us to move forward with confidence. “It is not possible to go forward while looking back” (Ludwig Mies van der Rohe). You cannot look back and move forward at the same time. Incessant retrospection is as deleterious as never looking back. At some point, you have to forget past triumphs, errors, wins and losses, and strike forward. Leave the past as rough notes on a story that you continue to develop. I am a surgeon, and I believe the difference between good surgeon and great surgeon is a great surgeon has no memory. He or she forgets both the complications and successes of previous cases, and continues to work for the best possible outcomes. Whenever I operate, whether it be a straightforward procedure or a high-risk complicated case, I draw on collective experience and knowledge – but at the same time – I remain free of any worry of that which has happened before. For, if you look too far back, you might stumble into tomorrow without living the time that exists today. Besides, looking back for too long is bound to hurt your neck. 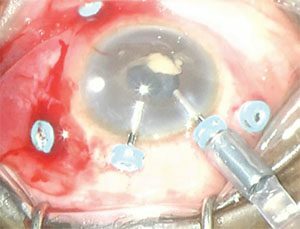 MEDICINE & MACULA: Check out our new feature in the September 2016 issue of Retina Specialist entitled, MIVS and Post-op Endophthalmitis: A look at evolving trends and techniques. 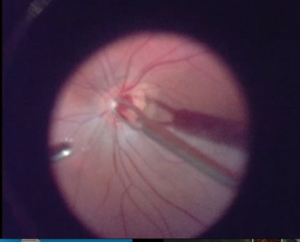 Thanks for the continued interest in our microincisional vitrectomy surgery (MIVS) technique for infectious endophthalmitis. 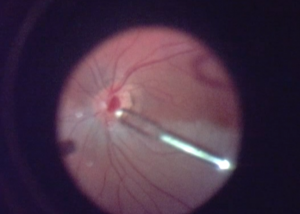 Early vitrectomy for endophthalmitis provides significant benefit in removing infectious material and look out for a study we are putting together on this topic. GRATIS: If you enjoy the Sunday Surgical Scrub, sign up with your email and receive a new Scrub every Sunday in your inbox! Also, I’ll keep you posted of updates and new material planned for 2017!